The care required for an invertebrate only tank is very similar to that of any other saltwater tank; however, the invertebrates are far less hardy than fish. It is recommended that you become skilled with a fish only tank before attempting an Invertebrate aquarium. Most Invertebrates require a specialized diet. Check with the supplier before purchasing and be sure that you are willing to make the commitment to have food delivered if necessary. There are two different types of invertebrates, tropical and cold water. Make sure that the type you are buying is compatible with its other tank mates. A few examples of tropical invertebrates are tube worms, red hermit crabs, cleaner shrimp and the sea apple. All of this marine life is compatible in terms of water conditions. They require a water temperature between seventy-five and seventy-nine degrees Fahrenheit, a P.H. between 8.2 and 8.4 and a salinity content of 1.020-1.024. As you can see, there is very little wiggle room associated with these measurements. It is extremely important to check the levels daily, or the results could be costly. These invertebrates are not compatible, however, with their food source needs. Check with the supplier for compatibility before combining tropical invertebrates. Unlike their tropical counter parts, cold water invertebrates are usually not sold in stores. They have to be collected from tide pools. It is important to make sure that these species are not on the endangered species list before removing them from their home. It is equally important to do research in order to verify that you are able to properly feed them and care for their very specific needs. 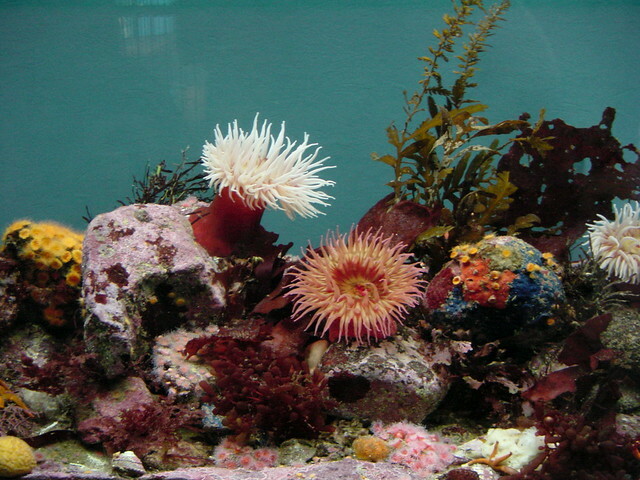 Sea Anemones, prawns, shrimp, and starfishes are a few varieties that have been successfully maintained in an aquarium. They require a water temperature between fifty-four and fifty-nine degrees Fahrenheit, a P.H. between 8-8.4 and a salinity content of 1.024-1.025. Luckily they do eat the same food. They feed off of a diet of small pieces of raw fish, shrimp, squid, and mussels. When keeping cold water invertebrates such as the species mention above, it is a good idea to keep a separate tank full of shrimp, mussels, and scallops to be used as a food source if you wish to use fresh rather than frozen foods. Be careful when keeping shrimp, as all of the invertebrates listed above feed on shrimp, including shrimp themselves. It is unlikely, however, that a healthy live shrimp will be eaten whole by another shrimp or starfish. Invertebrates should be fed more frequently in smaller amounts than fish. Try to feed only an amount that can be consumed in the first thirty to sixty seconds. When setting up an invertebrate tank remember to include live rock, because some invertebrates feed on the parasites that grow on the live rock. A substrate should also be included in this type of aquarium. It will provide a place for the crabs and shrimp to dig and bury themselves. A light should be included as well if you intend to keep anemones.